Founder of britishcontemporary.art, Mark David Hatwood FRSA, studied art & media at Bristol. He spent 35 years in the music industry, first as a drummer working with names like Mud, The New Seekers and Johnny Hates Jazz and later writing songs for bands like the Weather Girls and Culture Beat and producing with legends like Harald Faltermeyer (Beverly Hills Cop/Top Gun) and Rainer Oleak. In 2002 Mark wrote his first screenplay and novel, Marcello’s Date. The novel sold overnight and his screenplay was made into the international, multi award-winning film, Marcello Marcello. He was later commissioned to write nobel nominated, The Scary Guy’s biography and his own Gallery books, A Year of Thoughts and Pictures 1 & 2 are a firm favourite with his customers, blending his philosophical thoughts on life with some of his favourite artworks from THG’s in-house artists. We have worked with Mark for the last few years and found him to helpful and innovative in choosing work and artists for the hotel. He has a cache of interesting artists to choose from and together with his affable personality, he is a pleasure to work with. We would highly recommend him. Mark moved to Cornwall in 2004 where he founded two national-award winning environmental social enterprises, for which he was offered an unconditional fellowship of the RSA. Returning to his artistic roots, Mark took over The Harbour Gallery in April 2012 and in four years, increased its turnover by 500%. 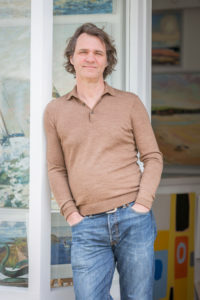 He forged some exciting relationships with award-winning hotels like the Scarlet, Bedruthan and the Driftwood, and in 2016, he expanded the gallery’s floorspace by 150% to now exhibit over 35 artists from Cornwall, the UK and internationally. I have collaborated with Mark and he was instrumental in developing the Art Galleries at both the Bedruthan and Scarlet hotels. Mark has been a joy to work with, is extremely knowledgeable, passionate and truly knows and understands the artists he works with. He has helped to train & educate myself and my department on the art sales procedures and continues to provide invaluable support to us all. In 2015, Mark launched the first global marketplace for pre-owned and new artwork, ArtRehome, which is now being used by thousands of people worldwide and he now regularly writes and has Podcasted for one of the UK’s biggest art magazines, The Artist. and writes the monthly Arts section for Cornwall’s most popular county magazine, Cornwall Today. britishcontemporary.art enables Mark to extends his partnership with even more of his favourite artists from all over Britain, including works of all subjects, mediums and genres.